Arrive EARLY for Salsa & Bachata Social Dance at 8pm, followed by a “Crash Course" Survival Dance lesson at 9pm in Salsa, Bachata and Cha Cha Cha, followed by Dance Party from 10pm til 1am with DJ Michael Luis, spinning the latest and greatest of Salsa-Son-Timba, Bachata, Merengue, Reggaeton and Cumbia. Thank you for supporting the dance community by tipping the bar staff and spreading the word. 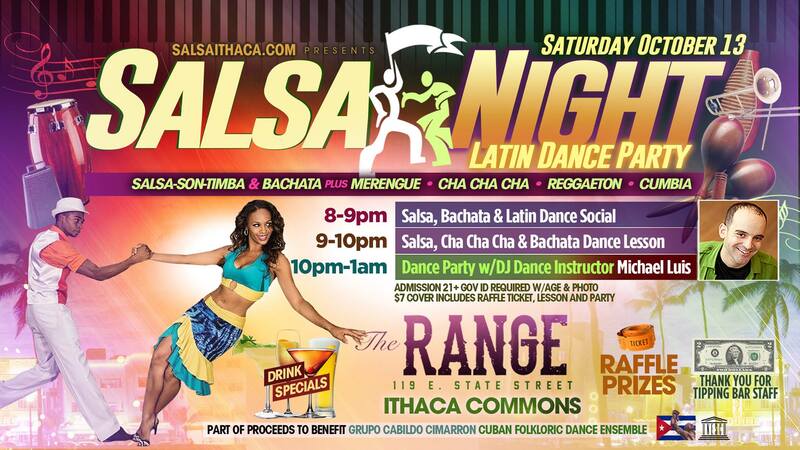 Join us… ¡Hasta la Rumba! Get an early groove on and meet other dancers at the party before the party. Learn Latin social dance timing, basic movements, lead-follow technique and fun step sequences for all levels. DRINK SPECIALS: $3 Tequila Shots, $3 Dos Equis Draft, $4 Cuba Libres, $4 Margaritas. Standard bar tipping is 20%-30% or $1-$2 per drink. Please support restaurant workers and the dance community by tipping bar staff.